Algae is a very real problem when keeping an aquarium. If not treated algae can overgrow and upset the balance of a fish tank, making the environment dangerous for both fish and live plants. Algae are not exactly a plant, but it is not an animal either, but like most living things algae requires oxygen, sunlight, and nutrients to grow. If an aquarium has an abundance of these resources it is possible for algae to make an appearance. 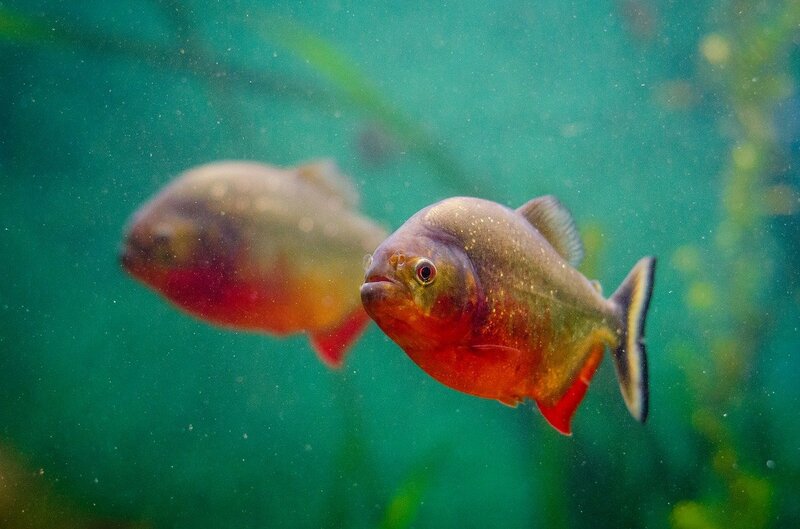 As algae grows it consumes oxygen, which means there is less oxygen in the water for fish. This can be fatal for fish. If left to overgrow on the walls of an aquarium algae can block light from entering the tank, and this can greatly reduce, or even prevent plants access to light. Without enough light plants die. Basically, algae is an unwelcomed guest in any aquarium, and it will compete with the fish and live plants that call a tank home for nutrients, oxygen, and light. It is important to remove algae as soon as it is spotted. The sooner it is gone the less of an impact it will have on an aquarium. Algae typically settles on hard surfaces, like the walls of a fish tank. The walls need to be scrubbed, or even scraped, to remove the growth. This used to mean sticking your arm in the tank in order to clean the algae. This is messy and a hassle. Many products make this task so much easier. There are fish tank cleaners on poles that let you clean the inside of the tank from the outside, and more importantly stay dry. There are also magnetic aquarium glass cleaners that can be used to scrub the inside of the tank clean from the outside. Algae is a normal part of fishing keeping, and every tank will experience algae growth at some point. There are even types of algae that are fine in a tank and will not cause harm. Managing algae growth in a tank is important to keeping the tank safe, and enjoyable. The key to cleaning algae growth is to get it early. The longer algae are allowed to grow the harder it will be to remove it. When selecting an aquarium glass cleaner choose one that is suited to your tank. For instance, some algae scraper tools are intended for glass and not acrylic. Glass is harder than acrylic and can take a more aggressive scrubbing, although it is possible to scratch both glass and acrylic tanks. If a tank is scratched it is not only unsightly, but it also creates an ideal spot for algae to grow. Using the incorrect fish tank cleaner can potentially create a bigger problem. In order for magnetic cleaners to be effective the magnets have to be able to grab one another through the tank walls, so for thick walled aquariums magnetic cleaners may not work. When purchasing an aquarium cleaner attached to a pole, or reach extender, make sure the tool can reach the bottom of the tank, in order to effectively clean the panels. 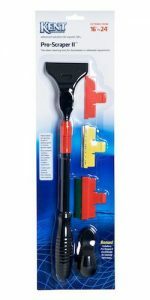 Stay dry, but remove algae growth with the Mag-Float Glass Aquarium Cleaner. This handy aquarium cleaner features two pieces that each contains a powerful magnet. When the two pieces are placed on opposite sides of a fish tank wall the magnets pull towards one another. One side features a scrubber pad that needs to be positioned on the inside of the tank against the wall. As the outer piece is moved the inner piece will follow, making it possible to scrub away algae growth from outside of the tank. The piece that goes inside of the tank is buoyant, so it is easy to move around corners. Should the magnets become separated the buoyant piece will float to the top for easy retrieval. This fish tank cleaner comes in three sizes, small, medium, and large. It is intended for use on glass tanks. This different sizes can clean tanks from 30 gallons with 3/16″ thick walls, up to 350 gallon tanks with ⅝” thick walls. It is important to handle strong magnets with care. Magnets can damage or interfere with electronic devices, such as computers, and even pacemakers. 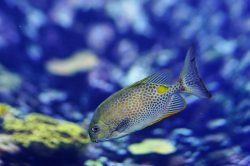 This cleaner can remove algae, but it may take several passes to clean the tank. The scrubbing pad could be more effective. Scrape algae for a clean aquarium with the Kent Marine Pro-Scraper II. 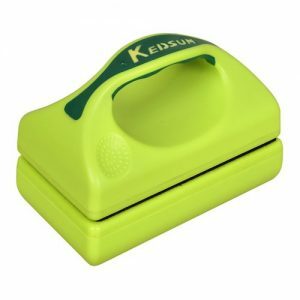 This handheld aquarium glass cleaner is made from durable fiberglass, so it can handle intense scrubbing and cleaning. The fiberglass construction also means this cleaner can be used in saltwater tanks, since it will not corrode. A variety of sizes, including short, 12″ and 24″, as well as telescopic 16-24″ and 24-36″ models makes it easy to find one to fit any tank. The scraper comes with three interchangeable blades to tackle a variety of messes. A fabric covered blade brushes away algae and can be used on both glass or acrylic fish tanks. The rust-resistant stainless-steel blade scrapes away stubborn algae on glass aquariums. The plastic blade removes algae on acrylic fish tanks. Blades are interchangeable for ease of use. As blades wear out they can be replaced (additional blades sold separately). The blades can be difficult to remove, which is a hassle if you want to switch between different types of blades to clean different areas, or even if a blade just wears out and needs to be replaced. When using the fabric covered blade make sure to keep it away from sand or gravel. If small particles of gravel or sand get stuck in the fabric it is possible to unintentionally scratch the tank while cleaning. Scrub away algae with this magnetic fish tank cleaner from Jasonwell. The two pieces each contain magnets, and when positioned on either size of a glass fish tank the pieces will stick together through the tank wall. This cleaner comes in small, medium, large, and extra large sizes. The bigger the glass cleaner, the stronger the internal magnets. The small cleaner is intended for use on glass tanks with walls up to 0.12″ thick. The extra large cleaner can take on tanks with walls up to 0.51″ thick. The inside of the handle is lined with felt, to protect the outside of the fish tank and easily glide across the surface. The handle also features a non-slip grip for comfortable and secure use while cleaning aquarium. The glass cleaner is effective at removing algae, but it takes a lot of scrubbing to do so. It would be more effective if it had a more abrasive cleaning surface. The magnetic halves do come apart sometimes while in use. This can be hassle; although, since the inner piece floats it is find it and put back together. Navigating corners, or moving to quickly can separate the magnets. At the first sight of algae in an aquarium simply brush it away using this long handled scraper. The abrasive scrubber pad (blue) is intended for use on glass aquariums, while the less abrasive scrubber pad (white) is for use on acrylic aquariums. Both quickly and easily remove even the most intense of algae growth. The large size of the scrubber pad covers a big area at once, making quick work on cleaning fish tanks and cleaning aquariums. The durable design can withstand extreme scrubbing. Measuring 19″ long, this glass scrubber is best suited for smaller tanks. It can be used in larger tanks without getting your hand wet when the water is partially drained. This scrubber does not accept replacement pads, so when the pad wears out the entire unit will need to be replaced. Make sure to keep the coarse scrubber pad away from sand, because the tiny, abrasive pieces can become stuck in the pad and will potentially scratch the glass when used. Algae is no match for the Flipper Aquarium Algae Magnet Cleaner. 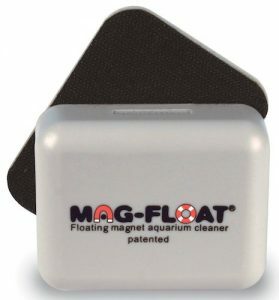 Imbedded magnets make it possible to clean the inside of an aquarium while staying dry. The inner piece easily flips from scrubber to scraper to remove algae growth and keep your tank looking its best. A low-profile design makes it easy to navigate this glass cleaner around plants or decor and clean hard-to-reach areas of an aquarium. The inner piece is buoyant, so if the magnets do come apart the piece inside the tank will float to the top, making it easy to find. Interchangeable blades keep the Flipper in top working form, since blades can be replaced as they wear out. Various sizes(small, medium, and large) can handle everything from small tanks with ¼” walls to large tanks with up to 1″ thick walls. This aquarium glass cleaner can be used on both glass and acrylic tanks. There is a real risk of scratching the tank when using this device. If sand, or any other abrasive material becomes lodged between the inner piece and the tank it is possible to scratch the tank when the cleaner is moved across the surface. It is also best to be very careful when using the blade to clean an acrylic tank. Acrylic is soft and scratches easily. Cleaning an acrylic tank with a sharp blade may scratch the tank. Scratches are an eyesore and they create a difficult-to-clean space for algae to grow. Take care of aquarium algae growth this this scraper multi-tool that features three interchangeable attachments. The stainless-steel blade attachment scrapes away algae. The plastic scrubber attachment takes on tough algae. Lastly, the shovel attachment can be used to scoop up fallen items for easy retrieval, or to rake gravel or sand. The fiberglass handle features a comfortable, ergonomic grip for ease of use. The tool comes in three different lengths (14″, 22″, and 34″) for use in small to large tanks. 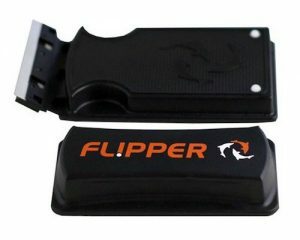 The fiberglass and plastic construction allows this multi-tool ideal to be used in saltwater tanks, since it will not corrode. The KollarCraft TOM Algae Scraper Multi-Tool is designed for use on glass aquariums only. 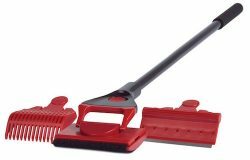 The scrubber attachment has rounded edges, making it very difficult to reach and clean corners or other tight spaces. The attachments can be difficult to remove, and this can be a hassle and slow things down when cleaning fish tank. 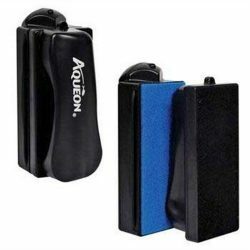 The Aqueon Algae Cleaning Magnet makes easy work of ridding an aquarium of algae. Various sizes clean different size tanks, including aquariums up to 300 gallons with ¾” thick walls. Specialized scrubber pads clean different materials. This fish tank cleaner includes one pad to clean acrylic tanks, and another to clean glass. The pads can be replaced, ensuring continued performance (replacement cleaning pads sold separately). Both halves of this aquarium cleaner feature internal magnets. When the pieces are lined up on either side of an aquarium wall they connect to one another through the wall. As the outer handle piece is moved the inner piece with the attached scrubber pad moves along and cleans the tank. The inner half is weighted, so if the magnets come apart the inner piece will fall straight to the bottom of the tank, so you know exactly where to find it. This tank glass cleaner does not fit into corners, or tight spaces very well, so it is still necessary to have another method to clean those areas. The scrubber pads are effective at removing algae, but sometimes it may be necessary to run the pads over the algae growth several times. Keep your fish tank clean and safe by removing algae growth with this magnetic glass cleaner. The KEDSUM Fish Tank Algae Scrubber uses powerful magnets in each half that are drawn together through the tank wall. This cleaner is intended for use on tanks with walls ranging from 0.55″ to 0.79″ thick. When the outer handle is moved, the inner scrubber pad follows the movement and cleans the tank. The inner half floats, so if the pieces come apart, like when moving over a corner, it is easy to find the scrubber and retrieve it without getting wet. The outer piece features an easy-to-grip handle for comfortable use. This tank cleaner can be used in both freshwater and saltwater, although it should not be stored in saltwater, because it can corrode when not in use. Powerful magnets make this cleaner effective, but they also carry a risk. Be careful not to pinch fingers between the magnets, and also keep this cleaner away from areas of the tank that are warm, like near a filter. If the tank is warm each half of the cleaner will lose magnetism and the pieces will separate. The easiest way to clean algae is to stop it before it even starts. Managing how often tank lights are on, and exposure to natural light, as well as not overfeeding fish, and quickly removing uneaten food are all ways to prevent algae growth. 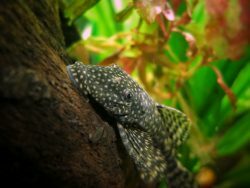 Adding live plants to your aquascaping, instead of artificial, will cut down on available nutrients in the tank, which in turn will reduce the risk of algae growth, since there will be less food available. 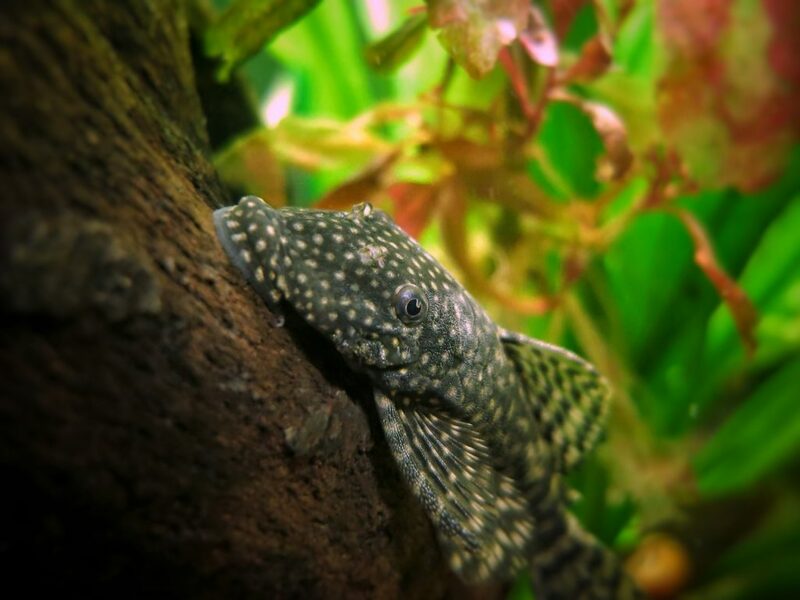 There are even different species of fish that eat algae, such as Plecostomus and Otocinclus, so they can help keep algae growth in check. Despite taking preventative steps it is still necessary to keep some type of fish tank glass cleaner on hand. The material and size of the tank, and sometimes even the thickness of the tank walls determine the best type of aquarium cleaner. 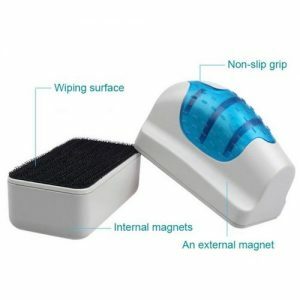 Magnetic cleaners make it easy to scrub and stay dry, but powerful magnets pose a few risks. They can be difficult to get apart, and can painfully pinch fingers while handling. A lot of times magnetic cleaners are stored on the tank, this prevents the hassle of trying to pry to pieces apart. It may not be ideal in small tanks, since it takes up space, or in saltwater tanks due to the possibility of corrosion. When a magnetic glass cleaner is stored on the tank it sort of becomes part of the aquascaping, so if it is considered an eyesore this may not be an acceptable solution. Both sticks with scrubbers attached and magnetic aquarium cleaners are a great way to clean fish tank glass or acrylic. When selecting an aquarium glass cleaner on a stick, or extender pole make sure to get one that is long enough to reach the bottom. Also look for a durable construction. Sometimes the only way to remove tough algae growth is through serious scrubbing, the glass cleaner needs to be up to the task. Please comment on this post with any thoughts, or questions, feedback, or experiences you would like to share.